Intelligence is like an underwear. It is important that you have it, but not necessary that you show it off. I would love to insult you... but that would be beyond the level of your intelligence. 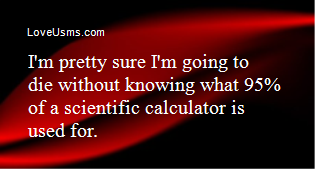 I'm pretty sure I'm going to die without knowing what 95% of a scientific calculator is used for. If ignorance is bliss, you must be the happiest person on earth. Shock me, say something intelligent.